In 1857 little was known about the Iowa Great Lakes Region. For its few inhabitants, it was a bitter, cold winter. Exposed to these harsh elements, a hungry and angry band of Sioux Indians seeking food and shelter roamed the Little Sioux River basin which eventually led to the confrontation and massacre or kidnapping of 33 pioneer settlers. When word spread of the now known, “Spirit Lake Massacre,” a small detachment of soldiers from Fort Dodge, Iowa, who suffered the cold, snow, and harsh frontier conditions made their way to the lakes region to identify and bury the dead of the massacre and dispose of any Indians encountered. Based primarily on the habits and needs of the nomadic Sioux Indians, the Iowa Great Lakes region was probably used primarily as a hunting ground and temporary encampment. The first settlers actually immigrated to the lakes region starting in 1856. In the early days, the entire lakes region was known wholly as “Spirit Lake.” The first clue of permanent habitation to the area occurred in 1859 when a makeshift flour mill was built on the narrow isthmus between Spirit Lake and East Okoboji. 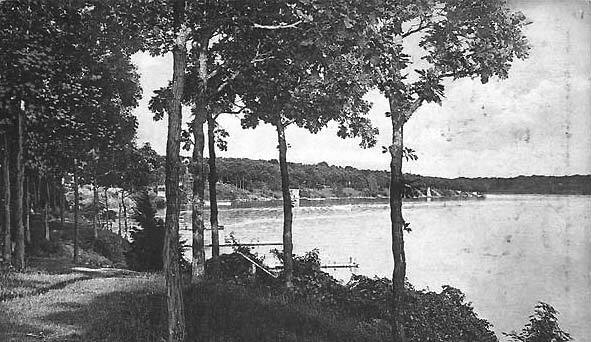 A channel was dug to transport water between the two bodies of water, but early settlers soon abandoned the facility because of lack of water flow to support the “old Red Mill.” It was discovered that the channel significantly lowered the level of Spirit Lake and also raised the water levels in East Okoboji. Of greatest value to early pioneer settlers migrating to the lakes region, other than the land itself, was the fishing. Since there were no laws regulating fishing at the time, massive amounts of fish were taken from all of the lakes in the area, both by sport fishing and commercial fishing. According to R.A. Smith in “A History of Dickinson County Iowa,” an important task among the early settlers was the naming of the different lakes, or rather familiarizing themselves with the names the French settlers and native Indians already had given the lakes. Spirit Lake was well known in the area as “Minne Waukon” by the Indians. This name was said to mean “the Spirit Water.” The early French settlers called the lake “Lac d’Esprit” which literally translated into Spirit Lake. The Dacotah Indians called East Okoboji Lake “Okoboozhy” and West Okoboji was assigned the name “Minnetonka,” signifying big water. Since there was already a large popular lake in central Minnesota called Lake Minnetonka, the Iowa Minnetonka name was dropped and renamed West Okoboji. At one time the west lake was attempted to be named Lake Harriot in honor of Dr. Harriot and the east lake was to be named Rice Lake in honor of Senator Henry M. Rice, the U.S. Senator from Minnesota. However, local inhabitants finally settled with the current names of West Okoboji and East Okoboji. There appears to be some confusion over the origin of the word Okoboji, but Professor T.H. Macbride says, “place of rest.” Others, however, seem to believe the origin of the word means “and there are others” from the Dacotah Indian translation. The area of land between the West and East Okoboji’s, which would eventually become the City of Okoboji, has been home to pioneers making camp and establishing roots in the area from the time of the earliest settlers. 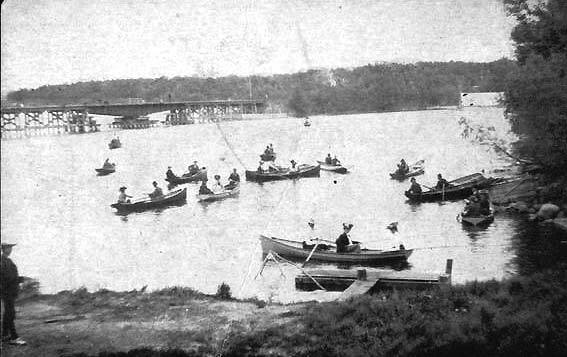 Modern settlements began to show up when the Okoboji bridge was built in 1860 connecting the channel that connected West Okoboji to East Okoboji. The original bridge was built 200 feet in length. Other amenities that brought about more resemblance of a community were being built in the 1870-1890’s, including the lakes region’s first church, new mills, first bank, and other commercial establishments. It was also around the end of the 19th Century to the beginning of the 20th century that homesteaders and immigrants first started building homes along the lakeshores. By this time, Spirit Lake had already become an established community and the county seat of Dickinson County. The City of Okoboji officially incorporated as a city in 1922 with a recorded population of 176 residents by 1930, the first year Okoboji was recorded in an official census. Posted HERE you will find a modest collection of antique postcards of the Lakes Region presented as a slideshow. Sources: Segments of this brief history were summarized and paraphrased from A History of Dickinson County Iowa, R.A. Smith, 1902 and History of the Iowa Great Lakes Region, John W. Parson, 1988.